Hope you all are doing great. From the beginning of this year, I had several personal issues and So I wasn’t active on my blog. If you didn’t read my previous post then you may read it here. Now am back with a full swing and you can expect new posts regularly. Since I’m trying hell lot of DIY and new products, you can expect several posts in this month. I’m also planning to do a haul post since I bought several new skin and hair care products. Who doesn’t love to have long and shiny hair, well I can’t find one who doesn’t love the long and shiny hair. I used to have thick and strong hair in my childhood days and due to board exam stress in my school days, I lost my hair volume. I’m trying to regrow my hair and I’m going to share a DIY hair oil blend that helps me to grow my hair and it also adds shine to the hair. Despite having wavy hair, my hairs are extremely silky and the credit goes to this DIY hair oil blend. You can notice the changes within 2 weeks of usage. Without much rambling let’s move on to the DIY. Ok, you read a long list of oils right, but you can adjust the oils depending on your hair type and hair need. I will mention the uses of individual oil and you can choose what your scalp and hair actually need. Take a clean bowl. Add 4 spoons of castor oil. Now add 5 spoons of olive oil and 7 spoons of coconut oil. Mix them well. Now add 5 spoons of sesame oil and 6 spoons of black seed oil. Mix everything well. Add 2 spoons of grapeseed oil and 1 spoon of argan oil to this mixture. Mix everything well. Transfer this to a clean empty bottle. Take required amount of the hair oil blend in a bowl and warm them using double boiler method. To warm oil, add the essential oils listed above or depending on your choice. Mix it well. Divide your hair into multiple small partitions and apply hair oil to the partitions. Concentrate on the scalp and also to your hair ends. 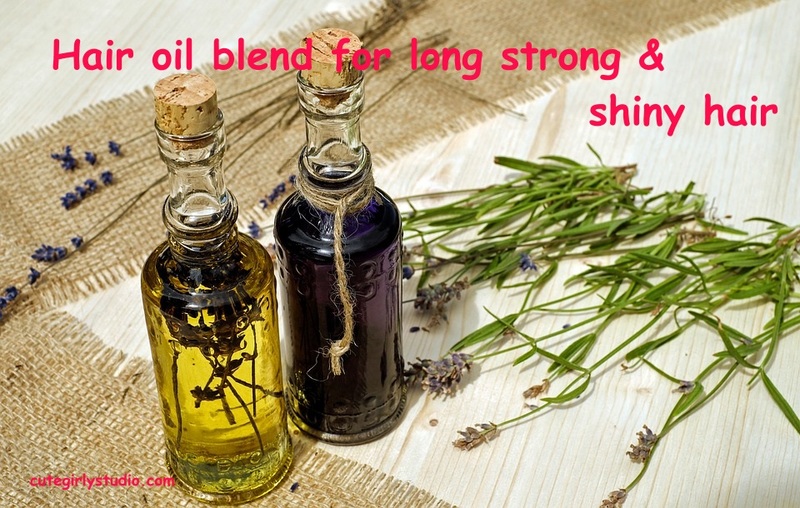 After applying this DIY hair oil blend, massage your scalp for 5 to 10 minutes. Then tie your hair in a bun or braid your hair. Leave it for 2 to 3 hours. I recommend leaving it overnight since it gives the best result. Then wash your hair with mild shampoo and condition your hair. Do this for atleast 2 times per week for stimulating hair growth. This also improves your hair texture. 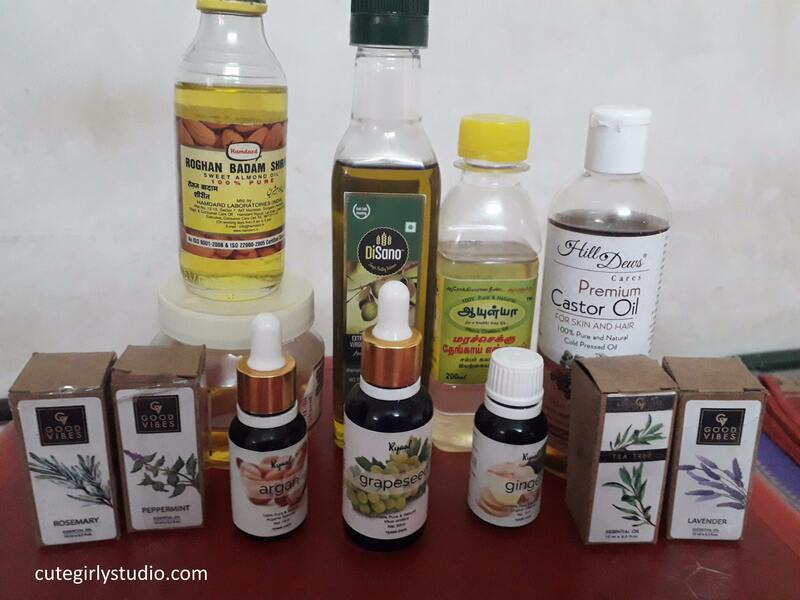 WHY I CHOOSE THESE OILS? Read the benefits below to know why I chose these oils. Coconut stimulates hair growth. It penetrates deep into the hair follicle. Coconut oil maintains scalp health. It prevents hair breakage and split ends. This oil adds shine and softness to hair. Coconut oil conditions your hair and also prevents dandruff. It nourishes and tones dry hair. It maintains protein and moisture balance. It is the best choice if you have dry and damaged hair. Olive oil makes your hair manageable. It makes your hair less prone to dandruff and split ends. 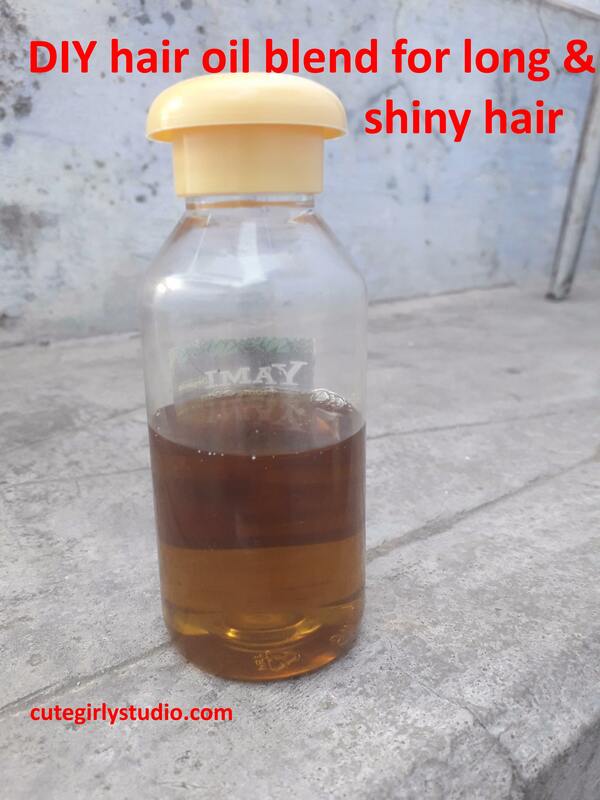 It reduces hair breakage to great extent. Rich in vitamins A, E, and antioxidants, olive oil helps protect the keratin in hair and seals in moisture. If you deal with brittle ends or frizzy curls that feel more like steel wool than they do soft locks, olive oil can help soften your hair, making it more pliable. Olive oil has been desired for its natural hair softening benefits, rather than having to use chemically-laden ingredients that are added to cheap hair conditioners. Many people who use olive oil on their hair will notice that it not only becomes softer and more manageable but that their hair grows in much thicker and denser. Saturated and monounsaturated fatty acids form 71% of the fatty acids found in sweet almond oil so it does have a good ability to penetrate the hair shaft and moisturize hair from the inside. Sweet almond oil makes your hair soft and silky. It nourishes your dry and damaged hair. It strengthens your hair and also reduces hair loss to a great extent. This oil improves blood circulation to the scalp. This oil doesn’t need any introduction. Castor oil stimulates hair growth to great extent. Castor oil is suitable for moisturizing hair, promoting hair growth, and preventing hair loss. It carries ricinoleic acid and omega- 6 essential fatty acids, which accelerate blood circulation to the scalp, hence increasing hair growth. Since castor oil possesses anti-bacterial, anti-fungal, and antiviral properties, it is the perfect remedy to tackle scalp infections and issues such as bald patches, itchy scalp. sesame oil can prevent premature graying, retaining the natural color of your hair for longer. sesame oil has hair darkening properties. Regular use of this oil will help darken your hair while keeping it healthy. Sesame oil improves the circulation of blood in the scalp, and it thereby promotes hair growth. It is also highly penetrative which helps heal chemical damage, and supplies nourishment to your hair shafts and follicles. Sesame oil has soothing and tranquilizing properties. Harsh heat can be damaging to the hair follicles. Sesame oil acts as a coolant, working from within and nourishing the scalp from inside and out. Sesame oil locks the moisture within, thus preventing further damage. Argan oil is proven to make hair softer, silkier and shinier. It is the ideal hair conditioner, and it can even help to treat split ends and tame frizzy hair. This oil is also great for making your hair feel softer. Argan oil has scientifically proven to be a good product for hair re-growth and cell regeneration. Black seed oil is rich in antioxidants and fatty acids which can help to cleanse and strengthen the hair and scalp. This oil is great when diluted with a carrier oil to soothe scalp conditions that cause inflammation, flakiness, and sensitivity. One of the unique black seed oil benefits is its uncanny ability to help restore hair loss. Grapeseed oil stimulates hair growth thus makes your hair grow faster. It reduces hair loss. This oil can easily get absorbed into your scalp and strengthen your hair from the roots while preventing other common hair troubles. Dandruff and other dermatological problems caused by the flaky or dry scalp issue can be treated easily by the grapeseed oil. This natural remedy can nurture the skin cells growth with its generous properties of nutrients and emollients. You may choose essential oils depending upon your hair concern. The essential oils that I have chosen have the following benefits. Ginger essential oil – Stimulate hair growth also removes dandruff. Tea tree essential oil – Reduces dandruff. Rosemary essential oil – Stimulates hair growth and also prevents premature hair greying. peppermint essential oil – Promotes hair growth. Improves blood circulation to the scalp. Lavender essential oil- It moisturizes the scalp, balances sebum production and is ideal for those who suffer from dandruff. Do try this and let me know how this helped you for you guys. Subscribe to my blog and follow me on Facebook, Instagram, and Pinterest.